Where's Tim McGee when you need him? : Is There A Problem Here? : Where's Tim McGee when you need him? Where's Tim McGee when you need him? 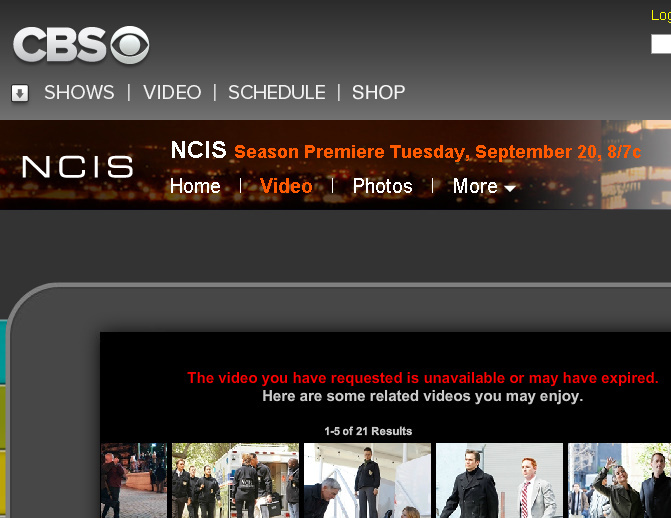 I click the PLAY button to resume playing an episode of NCIS that I paused several hours ago. It shows me several commercials, and then this: "The video you have requested is unavailable or may have expired." What does this mean? I had been watching the video. I paused it. I returned. It showed me advertisements as I waited for the program I was watching to resume. And now it says the video is unavailable or expired. If you can't show me the NCIS episode I was watching, how about explaining why? If this is a technical problem, how about helping me find it again? How about telling me you can't show it before showing me the advertisement? How is it you can show an advertisement but not programming? I bet McGee could help you fix this.